Most of Montana’s skyline is graced by not only big sky but big mountains. They are some of the most rugged and unforgiving places here in the West and home to an assortment of amazing animals, one of which is the mule deer. Mule deer inhabit almost every environment we have here in Montana from the river bottom to the highest peaks. 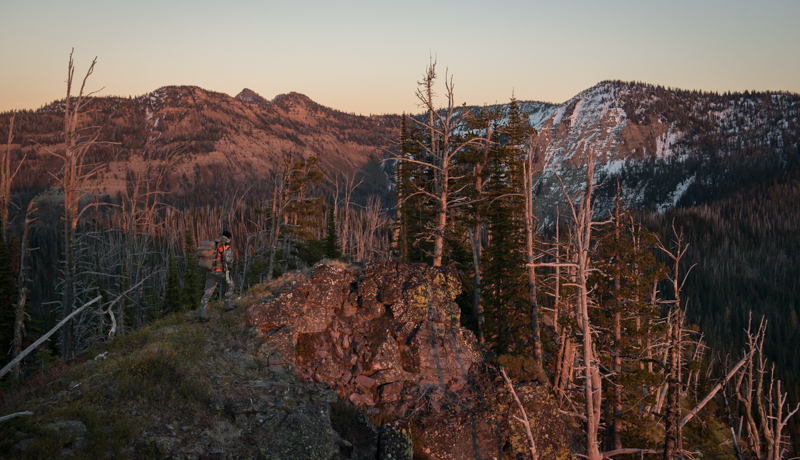 As a hunter I’ve always been drawn to the vast and wild places found in the mountains of Western Montana. 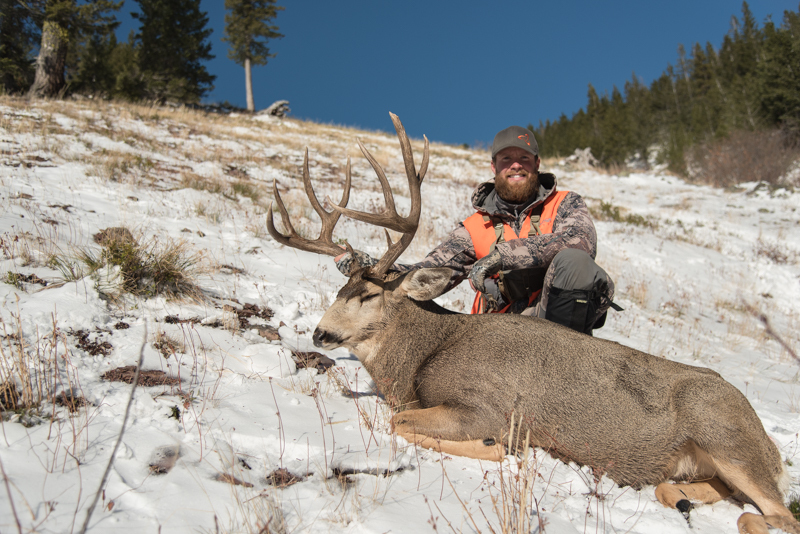 Get a few miles from the nearest road or trailhead and you quickly remember why Montana is referred to as “The Last Best Place.” Since I began hunting I’ve always been intrigued by the mountain mule deer and specifically a big, mature one. These bucks aren’t referred to as grey ghosts for nothing, as they rarely show themselves and are one of the hardest animals to hunt. For the past five years I’ve been going on some of the hardest hikes and hunts in search of a mature buck. These mountains aren’t written about in Eastman’s or Outdoor Life. These are mountains only a few locals call their stomping grounds. There’s a reason for that though. They are steep and amazingly thick and deer densities are very low. Going days without a deer sighting isn’t uncommon. 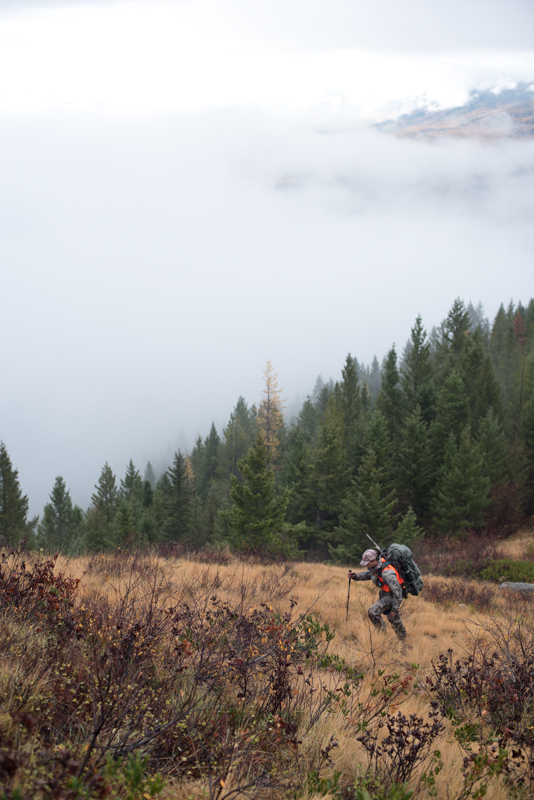 This fall my brother Travis and I once again loaded our packs up and hit the road. We planned a four day hunt were we would backpack in and live in the high country in hopes of just seeing a mature deer. 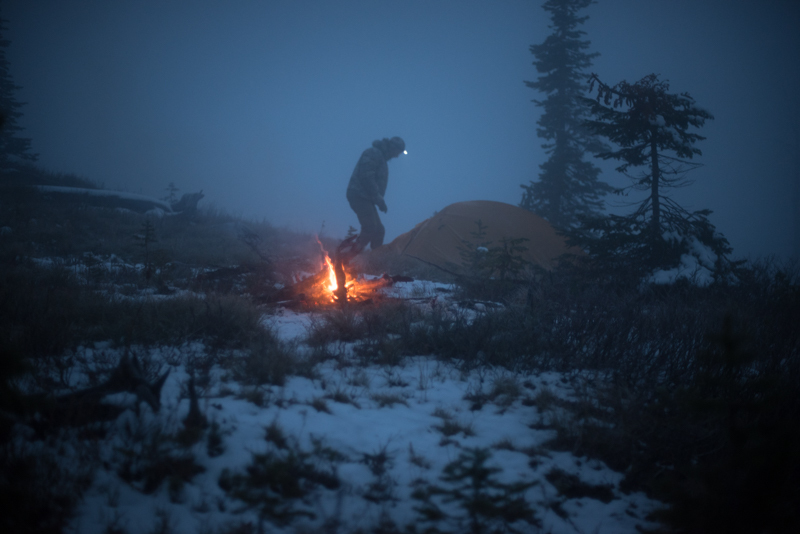 As the darkness faded we found ourselves on a ridge surrounded by a dense fog. Conditions were less than ideal but we pushed on hoping that the weather would change and give us some visibility. This was an area we had never been to before and being able to glass would be key to locating the pockets where the deer were hanging out. Soon a wet ridge turned to a snowy one and the fog and clouds failed to leave. After climbing 3000′ of vert with camp on our backs we were beat. We threw up the tent and hoped the morning would bring a change in the weather. As we unzipped the tent in the morning we were amazed to see clear skies. We quickly put on our frozen boots and worked down the ridge to a basin we had felt would be a good spot to find a buck in late October. The country looked good but we saw more coyote tracks than deer tracks. Despite being able to glass for miles we didn’t turn up a single deer that morning. 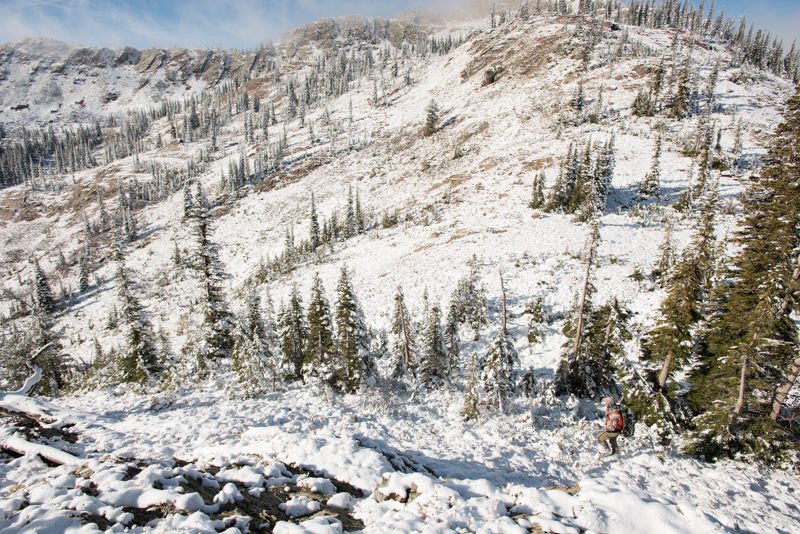 The decision was made to go back to camp, load up, and head south to a new basin and see what we could turn up there. Five hours later we clawed our way up and over a ridge to glass the last hour of light. That evening we turned up two does, a small buck and five cow elk. In these mountains that’s excitement and we felt like we were in the right spot to see a good buck. We again crawled into our sleeping bags and hoped the next day again would grace us with good visibility. The mountain had different plans. Again the clouds had rolled in reducing visibility to about 80 yards. With a small amount of service we checked the weather. The outlook was bleak with rain and snow forecasted for the next few days. With a few years of fighting this battle under our belts we knew if would be best to pull the plug and come back another time when the weather looked better. With camp on our back we still hunted back down the mountain to our truck. After spending time hunting elk in some other spots and a week long deer trip to Idaho we made the decision to come back with just a week left in Montana’s General Season. Travis was tagged out on elk and deer but came along to share the adventure. It had just snowed a little bit and the weather was calling for cold and clear weather. Ideal conditions for this country. We pulled in after dark and set up the wall tent. 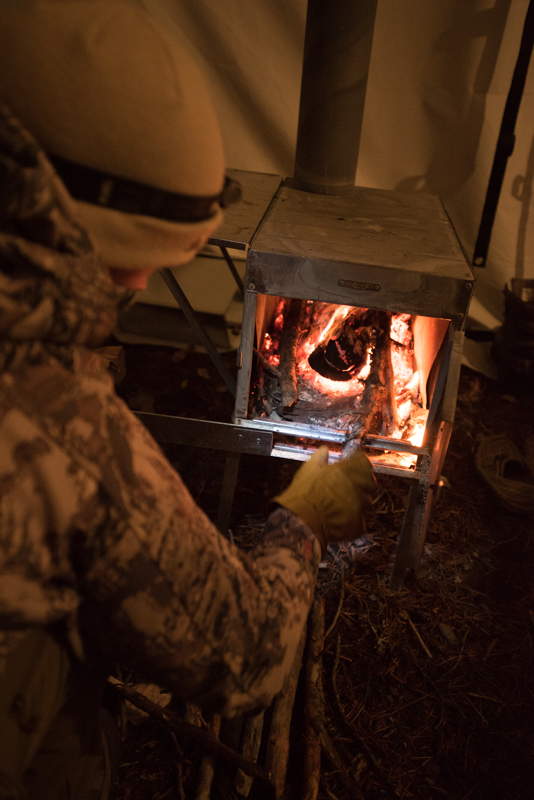 A fire was quickly started as the temps had dipped into the single digits. The next morning we headed up the steep mountain in the dark. 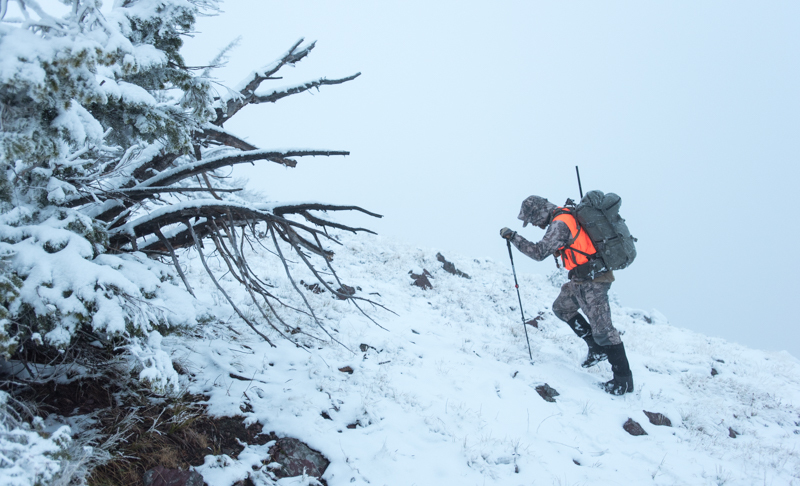 The going wasn’t easy as we had to climb 1500′ just to get to where we wanted to start hunting. That morning was slow as we only saw two deer tracks on the ridge and a small group of elk up near the top of the mountain. We sat on an outlook trying to decided what to do. I felt that sidehilling around the ridge would give us a good view into the next basin and we could look for tracks in the snow. As we eased through the timber we could begin to see a small avalanche chute. As I peeked up through the timber I saw a doe standing there looking our way. She must have heard us in the crunchy snow. I pulled my binos up and noticed that there were other tracks in the snow around her. I knew there were other deer and edged up the hill to my right. Suddenly I glimpsed a set of heavy horns to her left. I instantly knew he was a buck I’d be happy to tag. Without sizing him up I got a good rest on my knee and found the buck in my scope. I centered up my crosshairs on his muscular shoulder and slowly squeezed a shot off that echoed through the canyon. The last thing I saw in my scope was the buck instantly tipping over and sliding down the hill. A short celebration ensued and we soon were up the mountain looking at my buck. He had heavy, dark horns and a huge body. His neck was massive and a Roman nose told me he was an older deer. The Trophy Gold ammo had performed flawlessly. 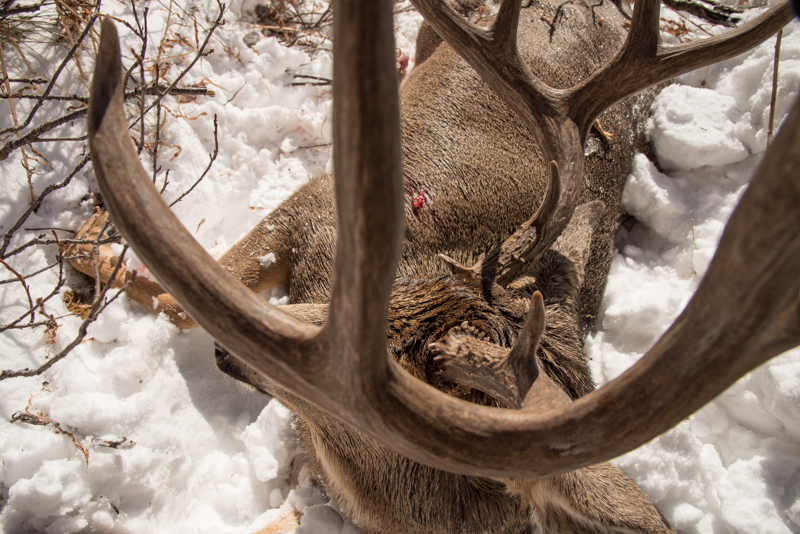 The buck had died instantly, something we hope for every time we pull the trigger. The 168 grain Berger VLD out of my .300WSM had done a great job and I had achieved my goal of tagging a big, old mountain mule deer. We took a few minutes to snap some photos before quartering and deboning all the meat. I was sure glad my brother Travis had come along as there was no way one guy was packing this whole buck off the mountain in one load. We split up the meat and shouldered our packs. 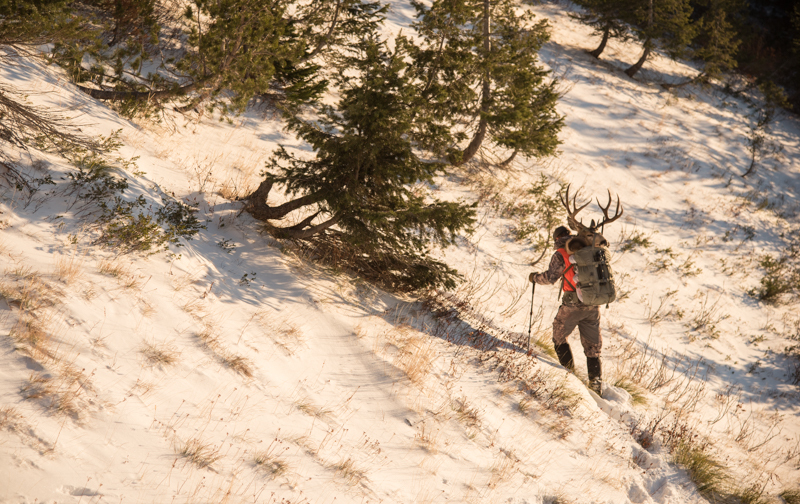 The route back to the truck was all downhill and the slow hike along the slick hillside gave me the chance to soak in the success of one of my most memorable hunts.